As a user of a rather large Android phone myself I am all too aware that the on board keyboard needs both hand sin order to type at any decent speed and now it looks like Google has decided to do something about it. 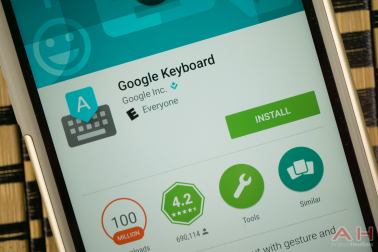 The latest update from Google brings one-handed keyboard use to big Android phones along with lots of customisation options. Big Android Phone? There’s a Google keyboard for that. The latest update has been rolled out and delivers lots of options for users of all sizes of handsets thanks to the ability set the height of the keyboard to suit your screen size and one-handed mode will work to keep at least one of your mitts free to hold something else. The one-handed mode is the biggest improvement on the update and it can be activated easily by a long press on the comma key, the keyboard can then be set to the right or left of the screen depending on which hand you want to use and it can be toggled back to full screen. Gesture typing has been tweaked with dynamic suggestion at the top of the keyboard instead of the word floating around with your finger as you type making it much easier to see and select the word you want. A swipe left along the delete key allows you to delete whole words rather than having to delete each carachter and you the borders of each key can be displayed to make it easier for you to get the key you are aiming for. This latest update from Google is rolling out now, so if you have not had it yet it will be winging its way to you very soon, think of all the possibilities as you master one-handed use of your big Android!